Hi everyone, welcome to another installment of me sitting in a corner thinking about what I did then writing about it. 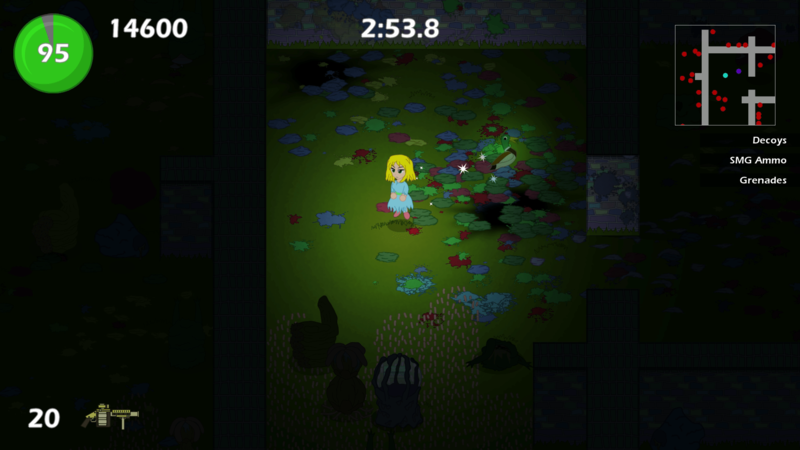 I wanted to push out a blog post sooner, complete with a new gameplay video. However, the day after I uploaded it on Youtube, I made some major changes to the graphics and I was no longer satisfied with the video. So I had to make a new one and then start writing about that. Can you see what has changed. Go ahead, I’ll give you some time to think about it. 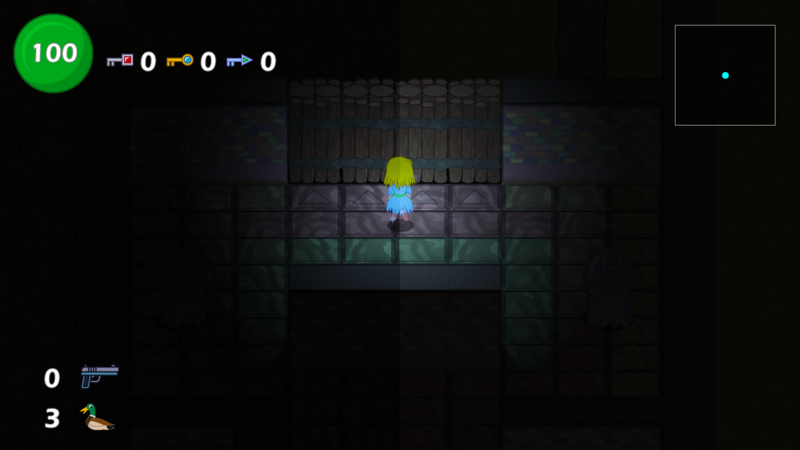 This first one is a bit unfair since it’s imperceptible: I rewrote the lighting rendering pipeline so that it works with GameMaker: Studio‘s native graphics pipeline rather than against it. This switch resulted in a 25% boost in framerate, though it’s not perceptible on my dev machine since it is able to render the game at over 60 fps. However, this might help some lower end machines run the game at the full framerate so they don’t have to cap it at 30. 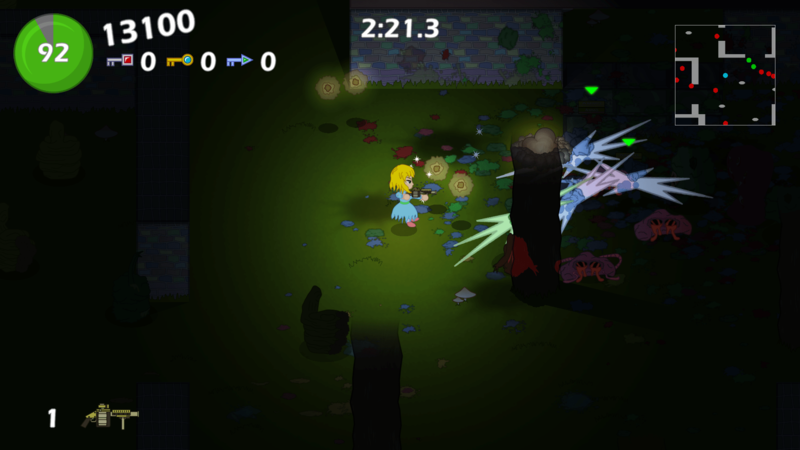 The increased brightness also allowed me to enhance certain particle effects, such as making the fairy dust created by Réiltín look actually sparkly. I fixed a long-standing problem with how the simple lights were drawn. 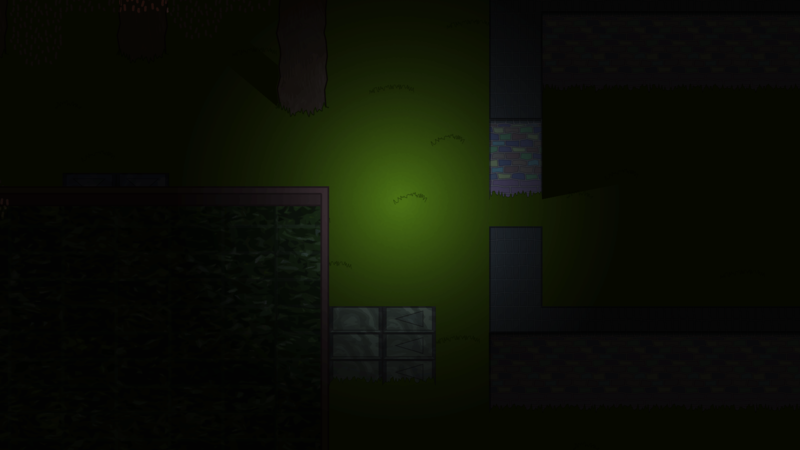 In my engine, simple lights are lightweight (no pun intended) light sources that don’t cast shadows. They are used for things like lamps, muzzle and explosion flashes, and glow effects. Originally, these simple lights were drawn in post-processing, i.e. 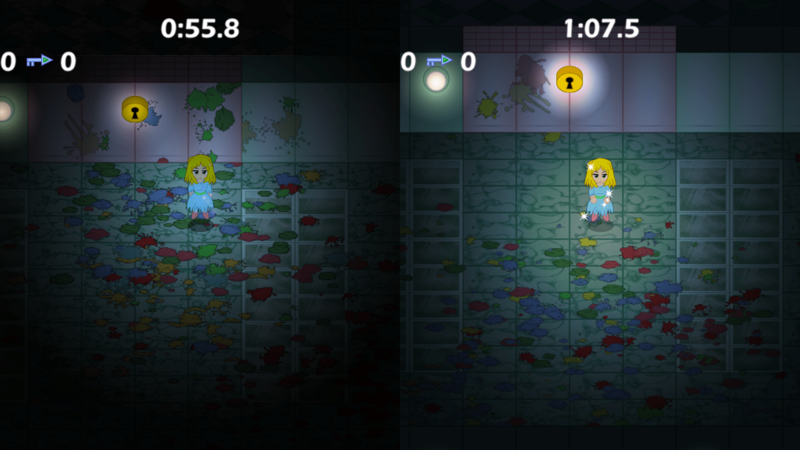 simply added on top of the regular (shadow-casting) light source. This had the effect of those lights shining through opaque objects when they should be occluded. 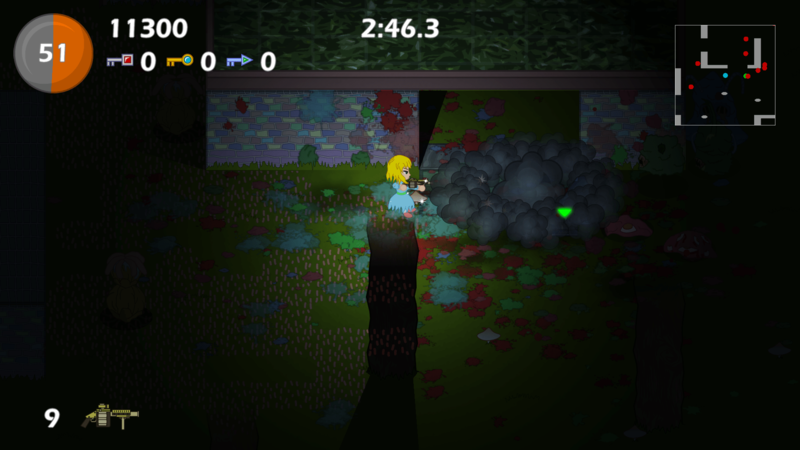 In the screenshot above, the spiky hit flashes are properly occluded by the tree trunk in front of them. I left in the option of allowing simple lights to be drawn in post-processing, as demonstrated by the dead, flashing red monsters being drawn through the tree trunk. I realize that giving all this information to the player really makes the game’s theme of obscuring things in the dark moot, but in the final game the player won’t have all this info all the time. They will have to use certain items or tools to get additional pieces of information. 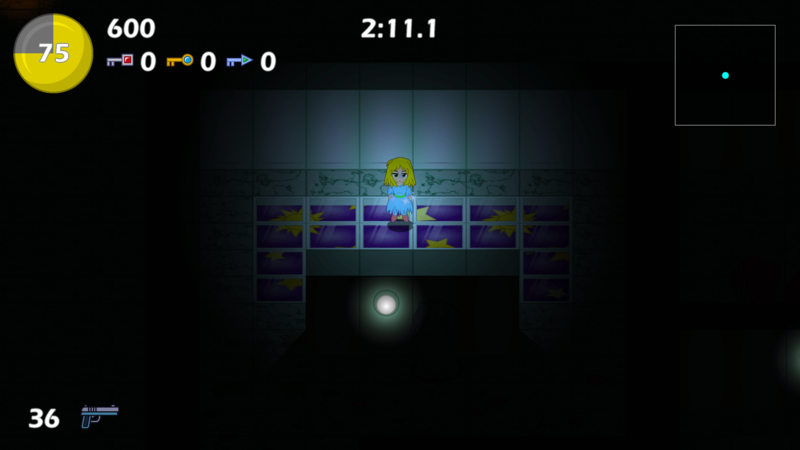 It might not be apparent from this screenshot, but this level is huge. 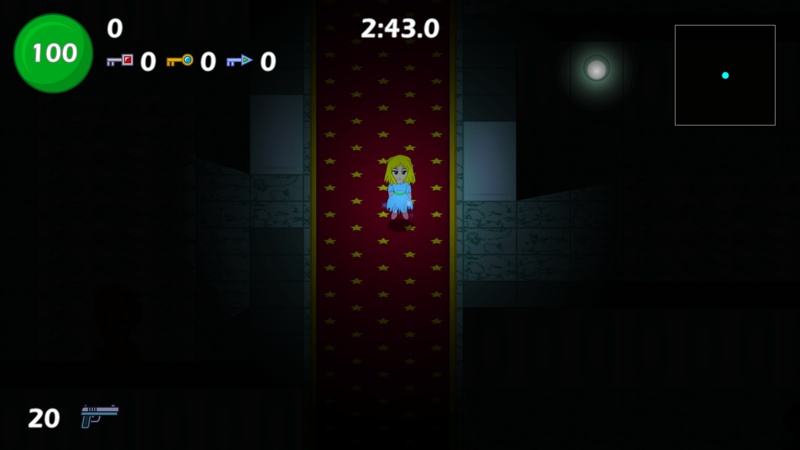 It’s the largest room I’ve ever created in GameMaker. 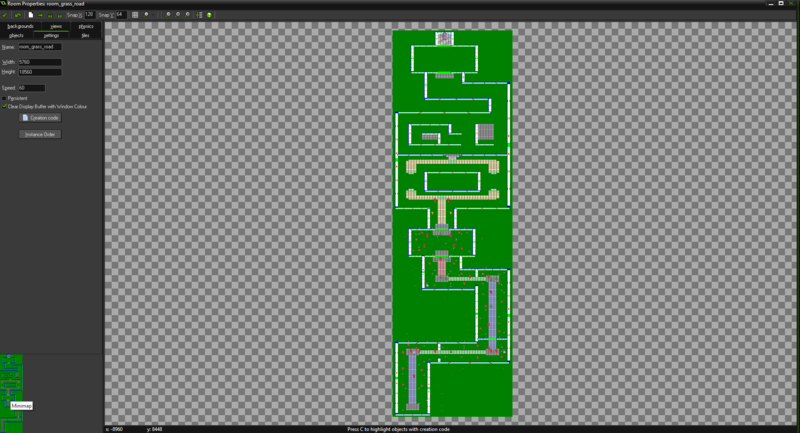 I had to make the sections wide enough to accommodate gunfights and the entire level long enough so that the player doesn’t just blaze through it too quickly. Birth of a new tileset, the miracle of… uh… graphic design? The sidebar on this site was a mess, so I decided to look it over and fix it. A summary of the updates to Feast for the Senses from the past month. If you have been following along my Twitter, then most of this might already be familiar to you. As I have been adding more and more weapons and items to the game, I found it awkward to switch between them using the d-pad. I know and played a few games that do this out of necessity because the right stick is mapped to a more important function, but then I realized I wasn’t using the right stick for anything. So, I changed the weapon/item selection system to a weapon wheel. I also redesigned my tilesets to remove or tone down the detailed skeuomorphic elements, which were clashing with the simpler flat elements. Something bugged me about how I designed my tileset for a long time, and I think this might be the reason why. I also bumped up the vibrance of the colours a bit too, as I thought the levels were looking a bit too dreary, and that I know has been bugging me recently. At first I was worried that having the grass as huge areas of flat green would make it look boring or make it hard to get a frame of reference when moving, but those grass tuft tiles that hug the sides walls, ground tiles and randomly strewn around everywhere really help make it look much better. Curiously, I don’t have any good screenshots of the old Marble tileset. They’re all either too small or animated GIFs. Because of that, I can’t do a fair comparison of the old and new Marble tilesets. Oh well. Current Projects: things I’m working on right now. Released Projects: things I’ve let loose on the Internet or in real life. Prototypes: things I’ve worked on but stopped because I’m not sure where to go with them. Has it been three weeks already? Well, fear not, as I have come bearing you good tidings and a new update on Feast for the Senses. I have added a new category of sub-weapons to Réiltín’s arsenal. I felt that the game needed more close-range combat options and more ways to engage with multiple enemies at the same time besides using the grenade launcher. When set on the ground, it takes a few moments for it to arm itself. When it does, it beeps and becomes fully invisible, leaving behind only a pulsing ring that indicates it’s activation range. 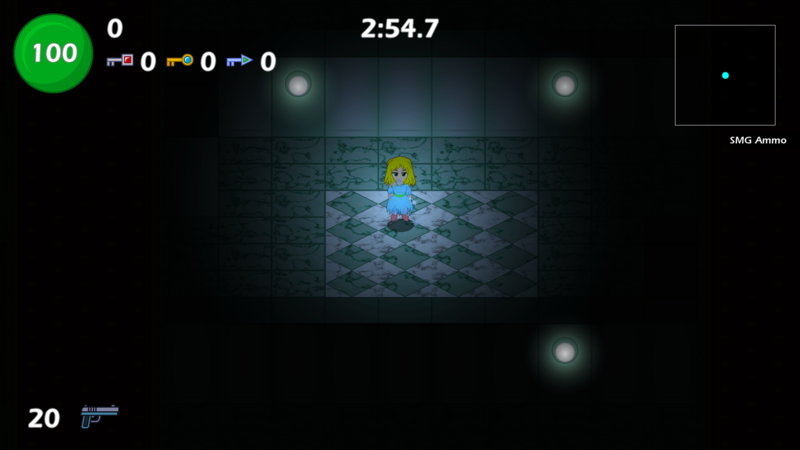 When an enemy wanders into the ring, the mine reveals itself, flashing and beeping. After a short while, it explodes with a blast strength and radius greater than that of a grenade. Réiltín cannot set off her own mines by moving near it, but she can set them off by using the explosion of a grenade or another mine. The second sub-weapon is the decoy. Not knowing how to depict the decoy, I just Google Image searched for “decoy”. The topmost results I got were all duck decoys used for duck hunting. I just said to myself, “Why not?” Fairies do have a reputation of being weird and inscrutable. When set down, the decoy will jump around, quack a song, and be all-around conspicuous and annoying, attracting the attention of nearby enemies. Since the enemy monsters are in-universe rely on their individual senses to track the player down, I thought the decoy should be some sort of an annoying and obvious sensory experience. Also, I just wanted an excuse to put the Flea Waltz in a game. The decoy has more drawing power than Réiltín herself, meaning she can drop one while being pursued and sneak away unnoticed, or get up close and attack without fear of retaliation. I finally got around to figuring out this 60fps GIF business. OK, I knew sites like Gfycat existed, but I just didn’t know how to convert my Fraps recordings into GIFs in the first place. But that’s all in the past now. No more awkward 25fps GIFs for me, now it’s 60 all the way… or 30 if some sites won’t let me have fun. Let’s start off this high-quality GIF thing with some improvements to the GUI. Until recently, I never focused much on the UI; it was mostly there to show me numbers and junk to tell me my game is working properly and not lagging. In the last week or so, I decided to give it a bit of love. The health meter shakes upon taking damage; the higher the damage, the more it shakes. The score counter goes nuts whenever it gets incremented. The timer pulses every second when time is running out. The ammo counter also pulses like the timer, but it pulses inward when ammo is being consumed and outward when it is replenished. 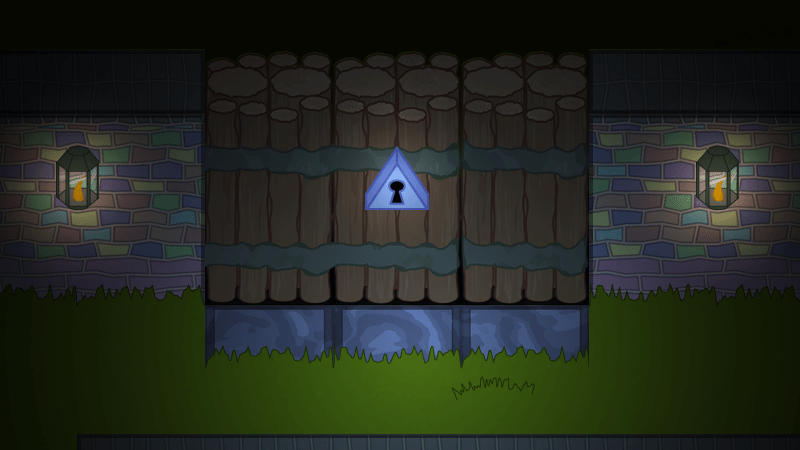 I redid the wall sprite because for a long time I didn’t like the old rough stone texture I generated in Photoshop; it was too detailed to fit in with the art style. 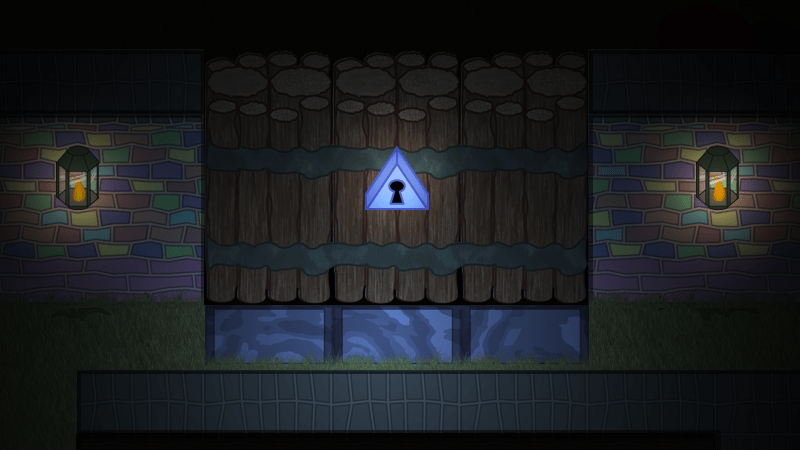 In addition to that, I added in some wall lamps to help modestly pierce through the darkness. I haven’t made any animations for the lamp’s flame yet; that will come next week. 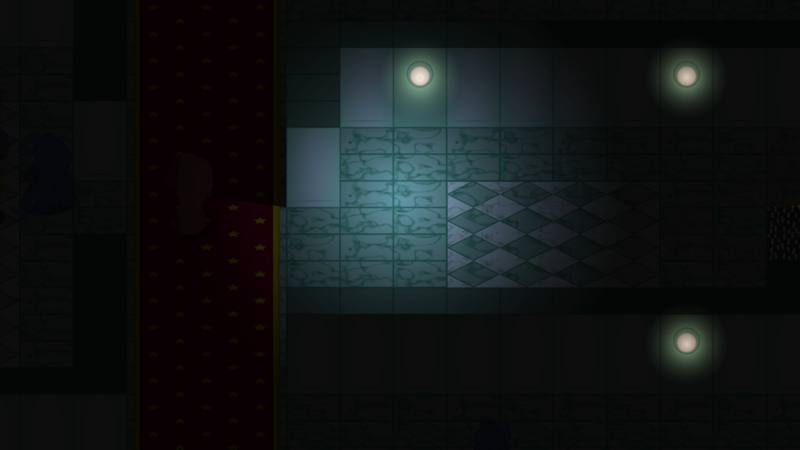 The lighting engine which Feast for the Senses grew out of has two different types of lights: regular and simple. 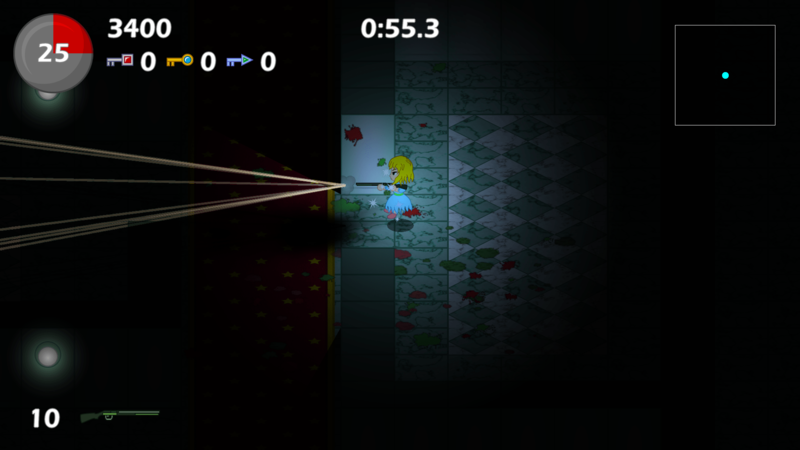 Regular lights cause walls, enemies and other obstacles to cast shadows and are relatively computationally expensive, while simple lights don’t cause objects to cast shadows and are cheap to process. Simple lights were only used for muzzle flashes and grenade explosions before, but then I figured I so get more mileage out of them and uses them for other purposes. OK, now it’s movie time. Here is how all the changes look in the context of gameplay.